MIAMI GARDENS, Fla. (AP) — Amid the unpredictable swirl of this year’s tennis results, with 33 different champions in 33 tournaments, Ashleigh Barty provides a change of pace. The crafty 5-foot-5 Australian mixes backhand slices and drop shots with a deceptively strong serve and a knack for attacking, which is how she won the Miami Open. Barty had a career-high 15 aces and became the newest 2019 titlist on the ATP and WTA circuits by beating Karolina Pliskova 7-6 (1), 6-3 Saturday. In Miami, Barty did. The former professional cricket player won her fourth tennis title and the biggest of her career to improve to 18-3 this year. At age 22, she’ll rise next week to a career-high ranking of No. 9. Barty became the fifth different Miami Open women’s champion in the past five years, and she’s the 14th different WTA titlist in 2019. Roger Federer could become tennis’ first repeat champion this year when he plays John Isner in the men’s final Sunday. Federer won Dubai early this month. Barty can strike quickly, too. Her surprising serve was superior in the final even though Pliskova is 8 inches taller at 6-foot-1. 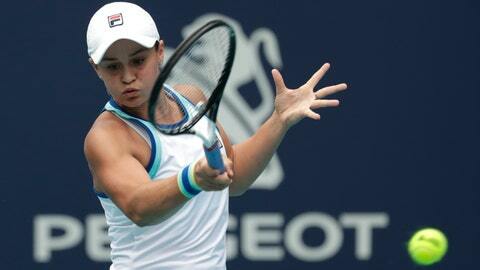 Barty made sure Pliskova never got her second wind, striking from all over the court. Among the Aussie’s most acrobatic shots was a leaping overhead winner struck while backpedaling in pursuit of a lob. The crowd loved it, and so did she. “It’s pretty cool to have played such a good match today in a big situation,” she said. Barty won the Wimbledon girls’ title in 2011 at age 15, but gave up tennis to play professional cricket in Brisbane before returning to the tour in 2016. This year she lost in the final at Sydney, a moment she listed as the most painful in her career. Less than three weeks later she reached her first Grand Slam quarterfinal at the Australian Open.